As both a librarian and wine-lover, I obviously read a lot of books on the subject of wine. There are countless titles ranging from encyclopedias to humorous memoirs and everything in between so there is something for every mood. Unfortunately, there are far fewer options when it comes to films about wine. Most people probably know Sideways, infamous for destroying the reputation of Merlot, but that’s about it. There actually are a handful of other wine films out there, and today I would like to talk about two of them: “Somm” and “Somm: Into the Bottle.” Written and directed by Jason Wise, both of these films are definitely worth checking out. I’m not going to lie, the people at Netflix are probably keeping a tally of my viewings, and I will soon be outed as the crazy woman who watched Somm 52 times. 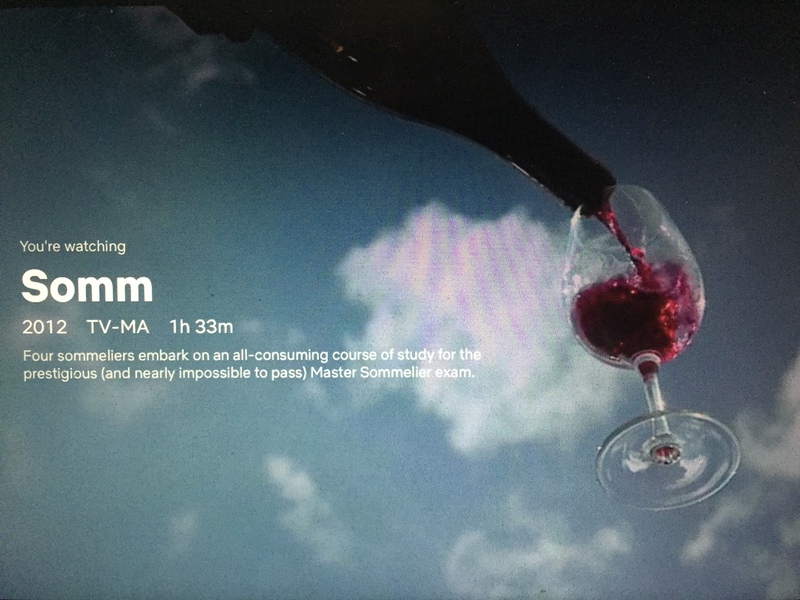 The original movie, simply titled Somm, follows a group of sommeliers who are studying for their Master of Sommelier (MS) exam. For those of you who don’t know, The Court of Master Sommeliers oversees the examination and credentialing of sommeliers in order to ensure standards of beverage service in the restaurants and hotels. The highest achievement is the Master Sommelier Diploma, which currently 274 people worldwide have achieved. Being eligible to take the MS exam means already having passed the introductory, certified and advanced levels. The exam consists of three parts—service, theory and tasting. Service involves the actual proper service of wine and other beverages (spirits, sake, beer) in a restaurant setting. Theory is a test on knowledge of everything wine-related from grapes to glass. The final part is the blind (or as I learned from Somm, deductive) tasting during which candidates have 25 minutes to taste and describe six wines (three white and three red) identifying the grape, country, region and vintages of the wines tasted. This is the magic trick of blind tasting that has always fascinated me, and that I, personally, am miserable at. During the film, we see candidates preparing for their exam, and we hear from some current Master Sommeliers about their own experiences going through the Court. If you’re thinking a movie about people prepping for a test is boring, you’re wrong. It is actually really interesting to see inside the world of people going through such a stressful situation. They are a likable group of guys, (and sadly, they are all guys — there is one female in their tasting group, but she’s not a central character), in spite of being highly neurotic and a touch bro-y at times. One of the moments that stands out for me is when Brian McClintic is talking about the worst-case scenario for the test outcome. The worst case isn’t that all of them will fail, or that only one of them will pass. The worst case, he says, is if two of them pass because that will mean the third person will be all alone to go through this again. In our culture of individualism, it is not often we hear someone speak to the fact that life is actually easier if you’re not doing it on your own.